If you are a Calflora contributor, you can use the Great Places applications to highlight your favorite places for viewing native plants. Places include both wild locations and gardens where natives have been planted. There are three component applications: a SEARCH page, a DETAIL page about a particular place, and an EDITOR for adding a new place. Great Places was developed with a generous grant from the JiJi Foundation. To view the details about a place, click on the name of the place in the table. An InfoWindow will appear on the map, showing where the place is, and with a link to the place detail page. Click this link to view the detail page for this place. (Alternatively, click on one of the points on the map. An InfoWindow will open showing the name of the place as a link. Click this link to view the detail page.) You can also click on the landscape photo next to the name to go directly to the place detail page.
. To limit the search to a particular part of the state, zoom the map into that part, and check in map area. To limit the search to the area covered by a particular CNPS Chapter, choose the name of the chapter from the Chapter Area drop down. The AREA column shows the size of the polygon in acres. The ideal Great Place record shows an area that a visitor can see in one day; probably not more than 3,000 acres. The DENSITY column shows the number of native species per acre. A high value of density suggests that a visitor will be able to see many plants easily (in a small area). Click on NAME, AREA, or DENSITY to sort by that column. 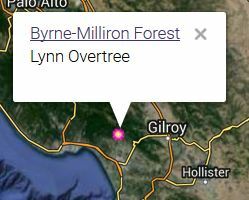 Here is an example of a Great Place page: Byrne-Milliron Forest in Santa Cruz County, contributed by Lynn Overtree and the Land Trust of Santa Cruz County. Exactly what you will see on a Great Place page depends on what the contributor chose to add. In this case, there is a paragraph about the place, landscape photos (example from Eileen Kitayama on the right), directions, hours, and tips (dogs are welcome!). There are also notes about trails, threats, and links to other websites for more information. Each Great Place should have a polygon boundary, which is shown on the map outlined in red. Excellent description and landscape photos. A little thin on local plant photos (so far). Not much description (yet), but abundant and excellent local plant photos from Chris Jaster, Jamie Smith, Richard Chasey, Vertin Alvarez, Bryan Derr, et al. Excellent description, including a paragraph about the history of the place. This is a discrete area (not too big), with some local plant photos. This page is based on a webpage prepared by the Tahoe Chapter of CNPS. The description is great, including details about hiking, facilities, and the best time to visit. 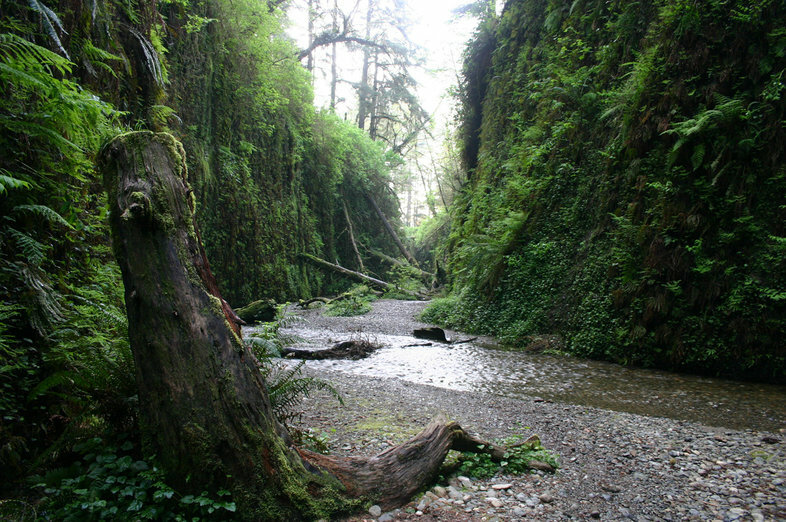 This is a heavily botanized place, with over 400 native plants identified in the area of the trail. The polygon covers the area traversed by three trails, which can be hiked in three or four hours. (Wouldn't it be nice if the trail lines appeared on the map?) Excellent landscape photos from William Flaxington (CalPhotos). To add a Great Place, first register as a Calflora contributor. You can do this on the Calflora Home Page: press LOGIN - REGISTER in the upper right and fill out the form. It takes about a minute. When you are adding a Great Place, and deciding what information to include, think of an audience of native plant enthusiasts not familiar with the area. Assume that they will not know anything about the the best time to visit, the steepness of trails, or the presence of bathrooms other than what you tell them. Once you are registered. open the Great Places Editor to add a place.
. After pressing this button, your next click on the map will become the point location of the Great Place record. button. That's it -- you have just made a Great Place record. Press the VIEW THE PLACE PAGE link (top middle) to see what this place will look like to other users. Make sure the places you enter are not too big. Choose the boundary of your place so that it is not any bigger than what a typical visitor could see in a day. There are some large parks where it might take a week to explore all of the trails. In the case of a huge park, it would be better to choose two or three connecting trails as a Great Place, rather than to make a single Great Place for the whole park. 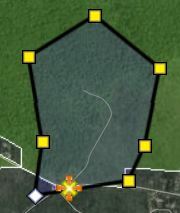 When you are entering a Great Place, after you have draw or selected the polygon, press Calculate Area to find out the size of the polygon in acres. If the area is greater than 3,000 acres, it is probably too big. Open this form to add the name, any keywords, the point location, and a polygon. You can also specify that this record is unpublished, meaning not quite ready for public viewing. Open this form to add descriptive paragraphs on a variety of subjects: directions, hours, history, culture, threats, trails, etc. Open this form to add photos. Photos of plants will come into the detail page from observations, so the most important photos to add here are landscapes. Open this form to add tips. A tip is anything a first time visitor might need to know to get the most benefit out of visiting this place, such as the best time to go for wildflowers, whether there are any bathrooms nearby, etc. Open this form to add links to other websites about this place. If the place is owned or managed by a private land trust, their name (and a link to their website) should go here. Sometimes hiking websites have really good descriptions of trails; it there is anything like that pertinent to this place, add it here. Note that a link to the relevant CNPS Chapter will be automatically included in each Great Place. Each chapter is responsible for a certain area of the state (see this map). If the point location of your Great Place falls within the boundary of a chapter's area, a link to that chapter will be included. When you come back to the Great Places Editor later, open MY GREAT PLACES to see (and/or edit) all of the Great Places you have entered. I just added a place. When I go to the Great Place page for my place and open THE PLANTS, not very many plants appear. The quickest way to get many plant observations into your place is to add a checklist, with the point location of the checklist inside the boundary polygon of your place. Use the Survey Entry application to add a checklist. If you already have a list of plants in an electronic form, you can use copy/paste to add them all at once. I know the plants that grow at my place really well. When I go to the Great Place page for my place and open THE PLANTS, I see plants listed that do not really grow there. A: The first thing to do is to figure out the record numbers of the plant observations that you think are erroneous, and then contact Calflora support. In your email, please include the name of the plant followed by observation record numbers. We rely on vigilant and knowledgable users for quality control; your efforts to correct errors are greatly appreciated.
. You should see the record numbers in the left most column called ID. When you write to Calflora, you can also simply include the URL of the Observation Hotline search. Q: How do I change the point location or the polygon of a place I have already added? A: Open the Great Places Editor. Open MY GREAT PLACES, find the place you want to edit, and click on the purple dot to begin editing that place. The NAME and LOCATION table appears. Click on the purple dot to open the form.
. Your next click on the map will be the new point location. Q: Why add a Great Place? 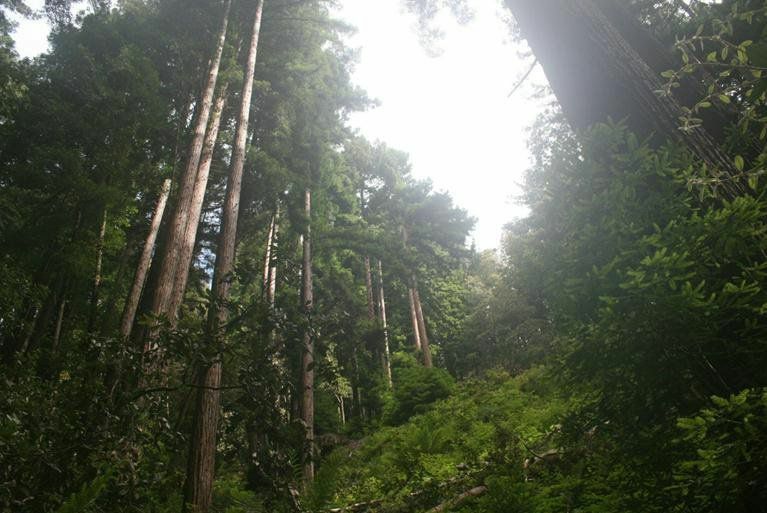 A: Calflora has the ability to show plant observations (with photos) within the boundary of Great Place. Here is what we are hoping to accomplish with the Great Places project. When a place appears in Great Places, contributors will be encouraged to make additional plant observations at that place. Over time, and through this kind of cooperative effort, the native plants in these places will become better documented. There has been an evolution of the way that Calflora is able to handle checklist data over time. In 2009 Calflora introduced the Checklist Entry application, with the ability to store a point location, a gross area, and a list of plants. The owner must explicitly edit the checklist record in order to change the plant list. In 2012 this application was enhanced with the ability to draw a polygon, and to calculate the area of the polygon. In 2016 this application was replaced by the Survey Entry application, with many additional features. With Great Places it is easier than ever to prepare a checklist of plants for a particular location. All the owner of a Great Place record has to do is to draw a polygon of a discrete area, and give the place a name. From then on, the Great Place record becomes an implicit checklist of all plants within that polygon. The list of plants is dynamic in the sense that any new observation record within the polygon will automatically become part of it. When you search for great places, you will see the AREA (size of the polygon in acres) and DENSITY (number of native species per acre) for each place found. Click on NAME, AREA, or DENSITY to sort by that column.